GLIMS (Global Land Ice Measurements from Space) is a project designed to monitor the world's glaciers primarily using data from optical satellite instruments. Read about the main features of the GLIMS Glacier Database. 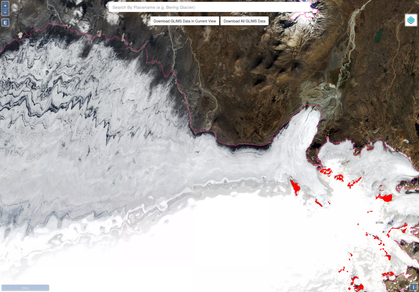 The Randolph Glacier Inventory (RGI) is a global inventory of glacier outlines. It is supplemental to the GLIMS database, and is a map of glaciers for one time and a collection of useful attributes. We continue to develop tools to aid in glacier mapping and for transfer of analysis results to NSIDC. An older software package is GLIMSView; other resources include documented procedures for GLIMS analysis, and web-based tools for data formatting and quality control. In practice, we have recently developed more tools for use here at NSIDC to ingest glacier data from a variety of sources, so a variety of tools may be used by analysts contributing data to GLIMS. Over 60 institutions across the globe are involved in GLIMS. Until early 2015 the project was coordinated by Principal Investigator Jeffrey S. Kargel of the University of Arizona Department of Hydrology and Water Resources. General coordination, technical development, and data management are done at NSIDC in Boulder, Colorado, USA. The research team at NSIDC currently includes Richard Armstrong (former Principal Investigator and current advisor), Bruce Raup (General Coordinator and Technical Lead), and Siri Jodha Singh Khalsa (Remote Sensing Specialist). "Glim" is an archaic Scottish term that means "a passing look; a glimpse; as much as is seen at a glance." In a future historical perspective, we may well look back on GLIMS and other early-21st Century remote-sensing of Earth's glaciers as a glim of a passing or changing phenomenon.